The Flash Trac® LTE is a feature packed state-of-the-art hardwired GPS tracker that uses both GPS (US) and GLONASS (RUSSIAN) satellites for accurate pin-point position fixes and reliable trouble free operation. Every 60 seconds, at Every Turn, Every 60 minutes when ignition is off. Plus, view vehicle history, see where it has been and view all routes driven. Identify poor driving behavior, impact events, unlock doors, disable starter, detects low battery, main power loss, monitor external motor, lights, switch statuses and alarm states (on/off), plus get over 17 vehicle related vehicle alert notifications! The Flash LTE operates on the simple and easy to use LiveViewGPS Flash Trac platform. You'll get one minute position updates, historical views, hi-resolution satellite mapping, geo-fences, harsh driving alerts, posted speed alerts and more for only $14.95 per month. The Flash LTE is installed under the dash of your car, out of sight and undetectable. Looking for Professional GPS Installation? LiveViewGPS maintains a list of qualified installers across the United States,please call us at 1-888-544-0494 for more info. Additional device features include a 3D accelerometer. This internal device is able to detect a driver who has a “lead” foot (accelerations), hard-braking, and hard cornering. Basically if your driving poorly the Flash Trac LTE can detect it. As an added bonus, the Flash Trac LTE can even tell if your car is getting towed! This GPS tracker also Includes an internal back-up battery, which alerts to tampering (if you main vehicle power is disconnected), as well as vehicle low voltage (battery going dead), and more. 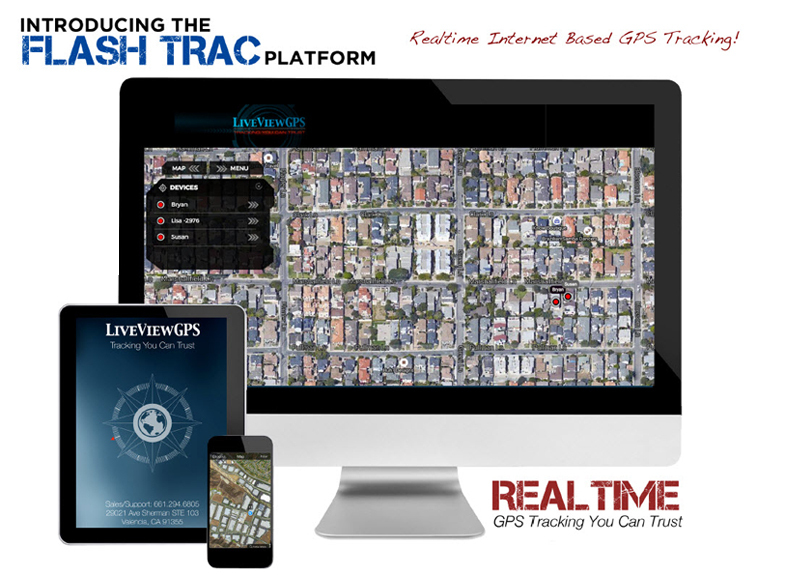 The Flash Trac® LTE interfaces with the Flash Trac® Web Based Tracking Portal, which is a user-friendly application that is accessible from any internet connected computer or mobile device. You'll get real-time tracking and a multitude of alerts for speed, landmarks, tampering and vehicle voltage, as well as a historical view. A 30-day money-back guarantee is included with every purchase, as well as month to month service. Low pricing make the Flash Trac LTE an affordable gps tracker for anyone in need of reliable gps tracking. The Flash Trac® system is a fully featured integrated gps tracking platform perfect for basic fleet and personal vehicle tracking. The Flash Trac LTE is effortless to use, intuitive and very user friendly. View locations from any mobile connected device. See current vehicle location, see where vehicle has been. All of North America! The United States, Hawaii, Alaska, Puerto Rico, Canada and Mexico, $14.95 per month per device. If you need international access, please contact us. All Flash Trac® LTE gps trackers ship for free via FedEx ground the same business day ordered. Call Us 1-888-544-0494 toll free, direct at 661-294-6805, M-F 7 am - 5 pm PST. Feature rich real-time on demand internet based gps tracking system. Flat rate unlimited use, 60 second updates, $14.95 month. No contracts. Flash Trac gives you more for less. Connect from any web connected computer or phone - no software required. High-resolution Google Map views and intuitive drill down control panel makes getting activity details fast and easy. Intuitive user interface lets you easily identify vehicles that are stopped, moving or even idling. Login and watch your car drive down the street, watch as it turns right, left, and the precise location it stops. Know how fast it's moving, was it speeding? See if the engine is on or off, and even how long it idled for! Go back at any time and view all routes traveled trip duration, how long stopped, start and ending addresses, even how many miles traveled. Custom configurations allow you to quickly view - street, map, terrain, satellite and hybrid views. Hide or show map and point of interest labels with the click of a button. You'll even be able to see live road traffic conditions. Get instant text and/or email alerts. The highly configurable alert editor lets you specify the days of the week you wish to receive the alerts, at what times, as well as time zones. Alerts can also be configured for computer desktop notification. Current list of configurable alerts for the Flash Trac HW device includes Landmarks, Engine Hours, External Power Lost, Hard Acceleration, Hard Braking, Harsh Turns, Hard Impact, Idle, Ignition, Mileage, Motion, Posted Speed, Power Lost, Speed Threshold, and Tow. Call Us Now, Toll Free: 1-888-544-0494. 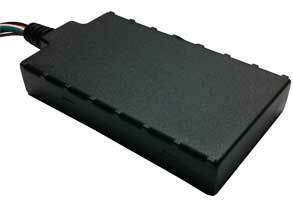 The LiveViewGPS Flash Trac® LTE is small hardwired LTE GPS vehicle tracker. The Flash Trac includes an internal 200 mAh backup battery. Dimemsions: 5.5" x 3.0" x 0.75"
I have used GPS trackers in the past and most of them are over complicated and cumbersome to use. With LiveViewGPS we have everything we need to keep track of our fleet at our fingertips. Simple, robust, and reliable product. We are very pleased with the GPS tracking for our company truck. The ease of being able to follow it and lookup routes is wonderful! If anyone is in need of GPS tracking for their vehicles or fleet of vehicles I highly recommend using Live View GPS! Very inexpensive but very precise! THE DEVICE IS WORKING FLAWLESSLY THUS FAR. I COULDNT BE HAPPIER WITH THIS PRODUCT!! My livelihood rests in my van The fact that I can check on where it is, see where is been is so comforting. The cost to monitor my truck is so low and there customer service and attention to detail with LiveView GPS is first rate. I recommend them to everyone in the trade or who needs to track assets. November 27, 2017 by Sam F.
The product works awesome. I bought it to comfirm suspicions of a cheating spouse. I will be keeping the unit to install in my teenagers car after I buy one for her. The reports are great saying where the went, how fast they drove, how long it sat idling, harsh turns. Only downside is it sometimes takes awhile to update location. Other than that, absolutely wonderful. October 11, 2017 by Andrew B. Only reason it's not excellent is that the maps are little bit hard to read (to me). There are arrows and different colored dots along the routes and no legend that I can see to decipher it. And when I click on a route, I will sometimes have to zoom out myself to see it. It's not done automatically. June 11, 2017 by Christina F.
We absolutely love our Flash Trac!! We purchased it for our small business and it is very easy to use and does exactly what they said it would. The mobile app is wonderful! May 29, 2017 by Vasana A. If you have teenager kids, put one of the LiveviewGPS products in their cars. You will be happy and your kid will drive with much more cautious, because they know you're watching them. The device will give you a lot of details...such as... where are they? where did they go?....how fast they drive....even how badly they turn at the corner. I am very happy I found Liveview! May 5, 2017 by Barbara B. From the first informational call to Dillon to the receipt and install this has been a POSITIVE experience. We are so impressed with this we have been sharing the news with some of our other hot rod friends and hope to generate you more business. February 15, 2017 by Lenny R.
I started off with one system I'm going to order another one for the Car now. Love it. February 9, 2017 by Ray L.
super good , that is all i can say . February 3, 2017 by Jerry S.
I've had the product installed for about a month now and so far it's proving to be an excellent device and is exceeding my expectations. The most impressive thing I have encountered however is the level of customer service and support. The speed of response and willingness to incorporate requested changes has been awesome. They even called me to give me a verbal update on the status of my request and again to notify me that my requested changes have been completed - this type of support is virtually unheard of in today's market. Overall an excellent product backed by excellent service. Highly recommended to anyone. January 4, 2017 by Mark L.
We really enjoy the features that come with this GPS. We are still learning how to work some of the features, but thus far, we are very happy with the services we receive. I like that you can see the road view and determine where our crew is stopping. December 21, 2016 by Rebekah Y.
I use the Flash Trac HW at Home to deal with a teenager that doesn't think he needs to tell me where he's going. I love that I can tell exactly where he's been, where's he has stopped, how fast he was going, and see his route. I was even able to figure out he'd gone off the road in a recent snow storm before he'd called me based on where he was at and the fact he wasn't moving. The only down side - he's been grounded from the car a lot more often and it's sitting idle more often than not! November 16, 2016 by Stoney P.
Only had it for 1 month. Found out our driver was cutting it off to do jobs to line his pocket. Fired him! Great tracker for tow trucks!!!! November 7, 2016 by Chris F.
This was exactly what my business needed. We had a new employee in a company car that we weren't getting any production out of. We decided to put a tracker in the car and it immediately confirmed our suspicions. I cannot recommend this highly enough. We had a GPS system in our autos five years ago. Went back to the same companies website. What a lazy website, no costs, plans etc. So we called them up, they said they would have someone call us back. Well, we knew nobody calls you back :). So, immediately found your site. Website gives the consumer choices right there and doesn't have to call. Sales person was beyond help. Service has been great, and yes the product works just fine every time. Thanks for everything...Been telling many others of this fantastic company. September 7, 2016 by Jessica B. So far so good! We have not been using the GPS's very long and we are still learning the system but everything is going well. June 29, 2016 by Carlton S.
I am quite happy with the performance of the Flash Trac HW. For Powered Assets With Exposure to Elements. Unlimited Flat-Rate includes all-inclusive Flash Trac features, including real-time one minute position updates, device history view, Google hi-resolution satellite mapping, live traffic, unlimited geo-fences, unlimited cellphone and email alerts, harsh braking, acceleration, and harsh turn alerts, as well as low battery, power disconnect, and more. Plus - (2) input notifications, 2 outputs, plan also includes lifetime technical support and unconditional no risk guarantee. Flash Trac Anti-Theft Plan: $79 Annual Payment. Locate on demand up to 25 times per month. Order Today! Ships same business day ordered! Shipping Is Free! Have A Question About "Flash GPS Tracker: LiveViewGPS Flash GPS Vehicle Tracker" ?